This gel-enhanced Memory Foam gently conforms to your body to help provide pressure-relieving comfort and added support. The iAmerica Commitment King Memory Foam Mattress by Serta at Furniture Fair - North Carolina in the Jacksonville, Greenville, Goldsboro, New Bern, Rocky Mount, Wilmington NC area. Product availability may vary. Contact us for the most current availability on this product. The Serta iAmerica Commitment mattress is an all foam mattress. A value priced mattress designed with a solid foam core and a layer of Gel Active™ Gel Memory Foam that helps relieve pressure and allows air to flow through the mattress for a cooler sleep. 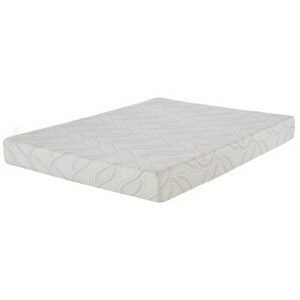 A good mattress for a stomach sleeper or a back sleeper who prefers a firmer feel. The iAmerica Commitment collection is a great option if you are looking for Mattresses in the Jacksonville, Greenville, Goldsboro, New Bern, Rocky Mount, Wilmington NC area.